Pianist Hung-Kuan Chen was born in Taipai and raised in Germany. His early studies fostered strong roots in Germanic Classicism tempered with the sensibility of Chinese philosophy. The winner of the Ferruccio Busoni International Piano Competition and Young Concert Artists International Auditions and the recipient of an Avery Fisher Grant, Chen has collaborated with conductors including Christoph Eschenbach and Hans Graf, and his colleagues include the Tokyo and Shanghai string quartets, cellist Yo-Yo Ma, violinists Cho-Liang Lin and Roman Totenberg, clarinetist David Shifrin, and pianist Tema Blackstone. 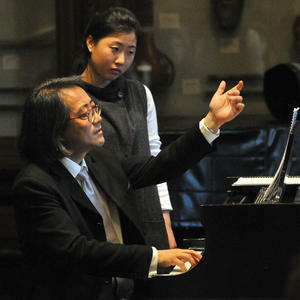 An adjudicator in international competitions, including the Van Cliburn Competition, Busoni Competition, Honens Competition, and International China Competition, Chen is a former faculty member of Boston University, the New England Conservatory, and the Shanghai Conservatory, and he has been a visiting professor at Yale since 2010. He holds an Artist Diploma from the New England Conservatory where he studied with Russell Sherman. His early studies were with Hans Leygraf in Germany at the Hannover Hochschule and with Béla Böszörményi-Nagy. He has been on the faculty at Juilliard, both in the college and Pre-College Division, since 2014. Sign up to receive updates from the Artemisia Foundation.